Observed orbits of satellite galaxies around host galaxies continue to be inconsistent with simulations based on the Lambda Cold Dark Matter (ΛCDM) model. Mainstream scientists believe that approximately a quarter (25%) of the Universe is made of an invisible and as-yet detected substance called “dark matter”. Dark matter supposedly explains not only the rotation of stars within galaxies but also the rotation of satellite or “dwarf” galaxies around other larger host galaxies. According to the standard Lambda Cold Dark Matter (ΛCDM) cosmological model satellite galaxies should be randomly distributed around their host while following long elliptical orbits along arbitrary paths. However observations of our own Milky Way galaxy and the neighboring Andromeda galaxy have revealed that their satellite galaxies appear to orbit in sync with one another in circular paths within disk-shaped planes around their own host galaxies. But because these were the only two host galaxies whose satellites’ orbits had been tested scientists were uncertain if the observations were random occurrences or if they posed a serious challenge to the ΛCDM model of galaxy formation and dynamics. But recently a team of astronomers led by the University of Basel in Basel, Switzerland published the results of their observations of the satellite galaxies around Centaurus A in the February 2, 2018 edition of the journal Science. They found that these dwarf galaxies orbited their host galaxy in the same manner as the galaxies around the Milky Way and Andromeda galaxies. Scientist are at a loss to explain how these observations are not consistent with more than 99% of comparable galaxies in standard cosmological simulations. If the ΛCDM model is wrong what could possibly be the explanation behind these observations? 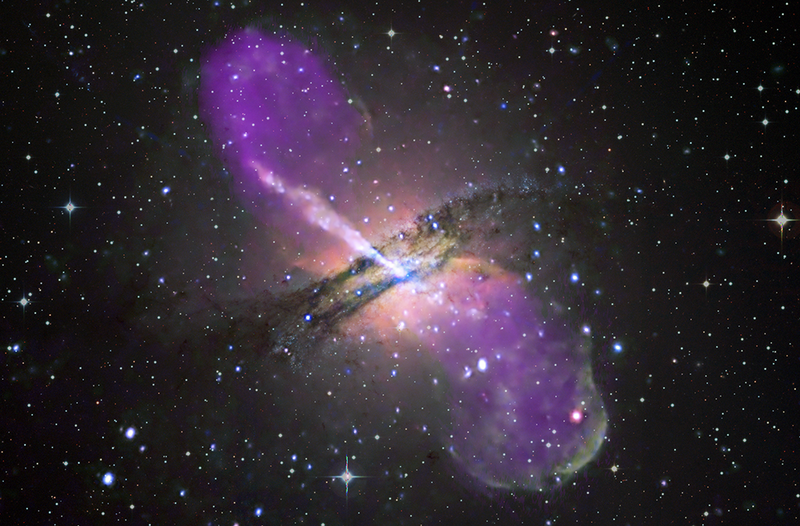 As proposed in the gallery section of this website, Centaurus A and its satellite galaxies are the result of the powerful electromagnetic dynamics between intertwined and interconnected large-scale plasma currents or “Birkeland filaments” that fill the Universe like a vast cosmic web. These filament interactions produced an enormous plasma discharge and resultant z-pinch which ejected intergalactic material as relativistic jets in opposing directions. This discharge is also responsible for the formation and structure of the Centaurus A system. Interestingly the plane of satellite galaxies for Centaurus A is roughly aligned with the path of its plasma jets. But these sort of galactic alignments are not at all uncommon and can be observed along the jets of such objects as 3C 31 (NGC 383) and Cygnus A (3C 405). It would be interesting to see if these strings of galaxies are also rotating around a central host in the same manner as the Milky Way, Andromeda and Centaurus A galaxies. It is these types of correlations that strongly infer a relationship between satellite galaxies and their orbits and the electromagnetic influences that shaped and maintain their host galaxies. The latest findings concerning Centaurus A, along with those of the Milky Way and Andromeda, do indeed pose serious challenges to the currently accepted cold dark matter model. But they can be easily explained in a Universe dominated by the electromagnetic force, a force 1039 (or one duodecillion) times stronger than gravity. There’s no need for hypothetical supermassive black holes, just more focused observations and study of charged particle dynamics in current mainstream astronomy and astrophysics research. X-ray: NASA/CXC/CfA/R.Kraft et al; Radio: NSF/VLA/Univ.Hertfordshire/M.Hardcastle; Optical: ESO/WFI/M.Rejkuba et al. One comment on "Satellite galaxy orbits versus cold dark matter"